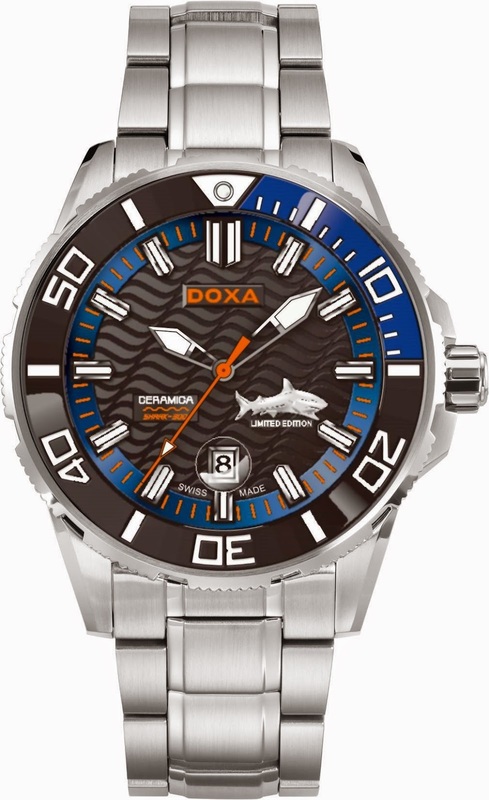 The new SHARK CERAMICA XL continues the DOXA’s passion for extreme sports and brand’s mission in making divers’ watches of the finest quality. Introducing a ground-breaking two-tone ceramic case, the new model sustains its outstanding performance in water resistance after a major makeover. The ceramic bezel has undergone a high-temperature firing treatment that results in the superior durability and anti-scratch quality of the piece, while polishing it with an impeccable shine and a glossy hue for the pleasure of the eyes. The new watch has a distinctive design with the unique combination of steel and two ceramic colours on the bezel. The D196SBU model integrates a black and blue ceramic bezel with a grey inner-bezel of minute indication, which is complemented by silver indexes, whereas the D196SGY model presents an alternative version with a black and grey ceramic bezel and orange-framed indexes in its grey inner-bezel. The generously designed dial of the three-hand watch assures rapid and accurate readability in poor light conditions thanks to the special luminous coating on the indexes. The eye-catching shark symbol, which is relocated from 3H to 4H, is renewed with a polished surface to enhance its 3D effect, and creates a seascape together with the wave pattern in the background. The new D196 is fitted with a 48 mm case with a water resistance of up to 300 meters, driven by an ETA 2824 Swiss automatic movement. A further extraordinary design detail is found on the case back, where the brand logo and a shark motif have been incorporated with a 3D effect. This model is limited to 2000 pieces worldwide.